55,653 sq km. Shimla is the state capital and other major towns are Dharamshala, Kangra, Mandi, Kullu, Chamba, Hamirpur, Dalhousie and Manali. The state boasts of numerous picturesque tourist destinations, which are responsible for generating much of the revenue for the state. Agriculture, textile and burgeoning hydroelectric power export industry are the other sources of income for the state. A state in North India, Himachal Pradesh literally means a 'region of snowy mountains'. It is also sometimes referred as 'Dev Bhumi' meaning Abode of Gods. 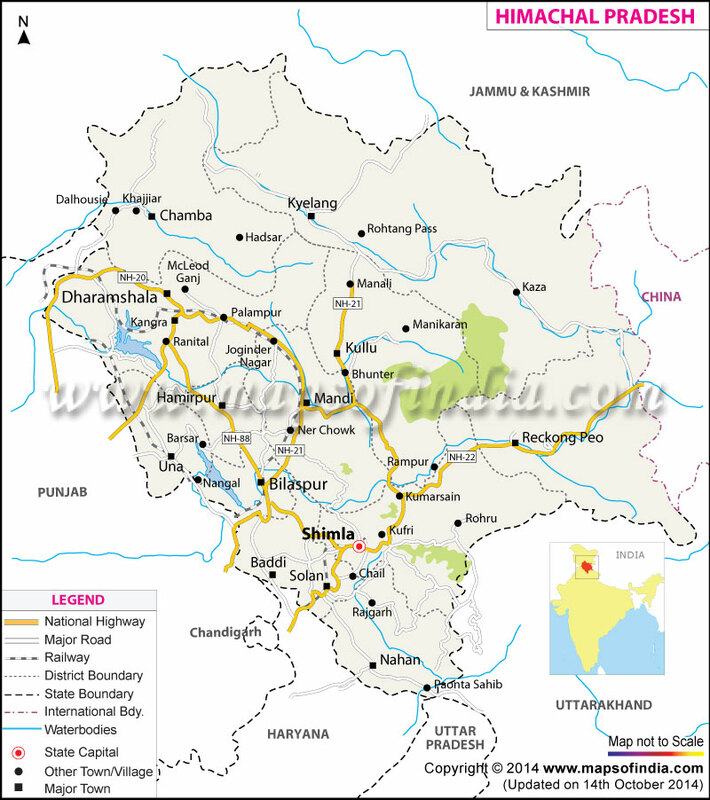 In the year 1950 Himachal Pradesh was declared as one of the Union Territories of India. Later on however, with the passing of Himachal Pradesh Act of 1971, it emerged as the eighteenth state of India. The word 'Hima' actually means snow in Sanskrit terminology. Acharya Diwakar Datt Sharma, an eminent Sanskrit Scholar from Himachal Pradesh named the state. Himachal Pradesh is among those states in India, which has a very per capita income. The state sells hydro electricity power to Punjab, Delhi and Rajasthan. The economy of Himachal Pradesh depends greatly on tourism, hydroelectric power and agriculture. Shimla serves as the state capital that was earlier the summer capital of the British. The head of each of the Districts in Himachal Pradesh is a Deputy Commissioner also known as Deputy Magistrate. For administrative purposes, the districts are further divided into sub-divisions, which are controlled by the sub-divisional magistrates. The sub-divisions are further divided into blocks. Blocks comprise panchayats that is the village councils and town municipalities. The law and order in the district is maintained by the Superintendent of Police. The Geographical Location of Himachal Pradesh is 30' 22' 40" North to 33' 12' 40" North latitude and its longitudinal extent is 75' 45' 55" East to 79' 04' 20" East. Himachal Pradesh occupies an area of 55,673 sq km. The capital of the state is Shimla. Himachal Pradesh is divided into twelve districts and it has 49 cities and towns. It comprises a population of 6,077,248, out of which the number of males is 3,085,256 and the number of females in the total population of the state is 2,991,992 according to the census of 2001. The state of Himachal Pradesh, India is a hilly region and it experiences a pleasant climate through out the year. It even experiences heavy snow fall during the winter months. The weather of Himachal alters with the change of altitude. The best time to visit the state of Himachal is from September to March. The population of Himachal is culturally rich and diverse at the same time. The communities residing in the Himachal region are very cordial people and they maintain a very well knit society. A very strong fellow feeling works in these simple people. Located on the western corner of Himalaya, Himachal Pradesh acts as the confluence of the pristine streams that are flowing through the quaint terrains of the majestic Hill. Characterized by thick cover of snow, the Chief Rivers of the state melts down in the summer months to satisfy the water consumption needs of the place. Pahari painting is done in the Basohli and Kangra styles; Kullu shawls and woollen caps are famous; the Chamba Rumal has Kangra style paintings embroidered on cloth. The world's oldest democracy is believed to be a tiny, isolated village called Malana. Shimla was the summer capital of british India.